For features and views see: http://www.gobooks.com/ . 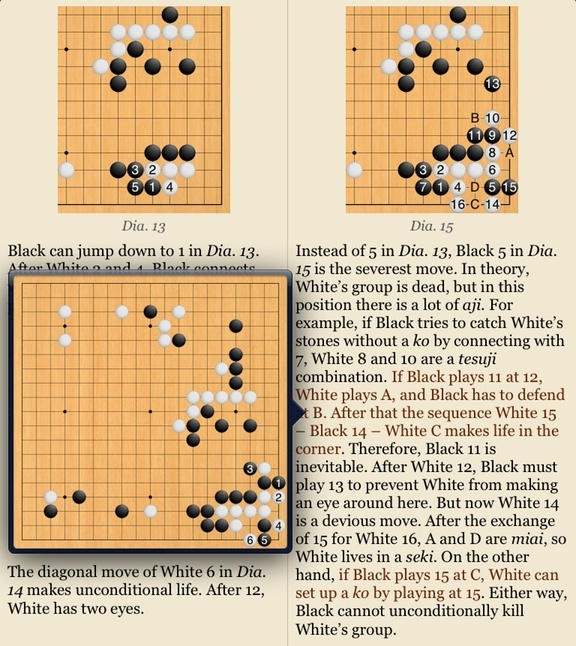 SmartGo Books is an interactive reader for Go books available for Apple iOS devices such as iPhone, iPad and iTouch (iPod Touch) as well as for OS X (Mac), created by Anders Kierulf. After registering, books purchased on one platform are available on the other. Unlike a PDF document, users can navigate backward and forward through the moves in a diagram or view them all at once. Users can also play out their own moves directly in the diagram. This is especially helpful for problem diagrams where SmartGo Books will provide feedback on whether one's move is right or wrong. It can also be used to consider one's own ideas in the context of a given board position. SmartGo Books offers a selection of books that are out of print, some of which may not be easily obtained in any other way. The most up-to-date list can be found at http://www.gobooks.com/books-by-category.html#outofprint .